Although I've been drawing long before I began to write (aged 8 when I first wrote a story for English that kicked off my I'M A BORN WRITER thing), I don't really consider myself an artist. I'm a creative type, and I'm a writer, but the idea of attaching 'artist' to my name absolutely terrifies me. Whilst I know art is subjective, I also know I'm not good enough IMO to be an artist. I'd love to do a bit of digital drawing now and then - or at least be able to colour and print my hand drawn designs, but I don't have the software most people use and it's not really on my list of priorities. Nonetheless, I absolutely love to draw, work in my journals and get really messy with acrylic paints. Drawing my doodles - I call them this so people don't take them too seriously - and working in my art journals are some of my best creative releases, as I find it therapeutic and as it doesn't require too much thinking, I can distract myself focusing on the music I'm listening to than worry about whatever is going on in my life. This equipment isn't for my art journals or anything, but strictly for my doodles. I tend to draw a lot of cutesy, tattoo-flash inspired bits and pieces as I've pictured above! So, while I'm not an artist or expert by any means, I thought I'd share with you the stuff I like to use for drawing. I'm pretty much obsessed with these. Whilst they aren't cheap, I adore using them as they're rather easy to get the hang of. They make blending and shading so effortless, and it only took me a few tries with the pens to really get used to them - they are a little bit like watercolour felt tip pens, although probably not quite so flexible in terms of applying, erasing and mixing colours. I don't own a whole lot of them so far, which makes me quite limited in what colours I have available to use, but they are fab. They're double-ended with a harsh, square angled tip on one end, and a brush tip on the other. I almost solely use the brush tip. At the moment I own a lot of primary and secondary shades - yellows, oranges, greens, blues and reds - but I'm slowly branching out into the pastel spectrum of these colours. 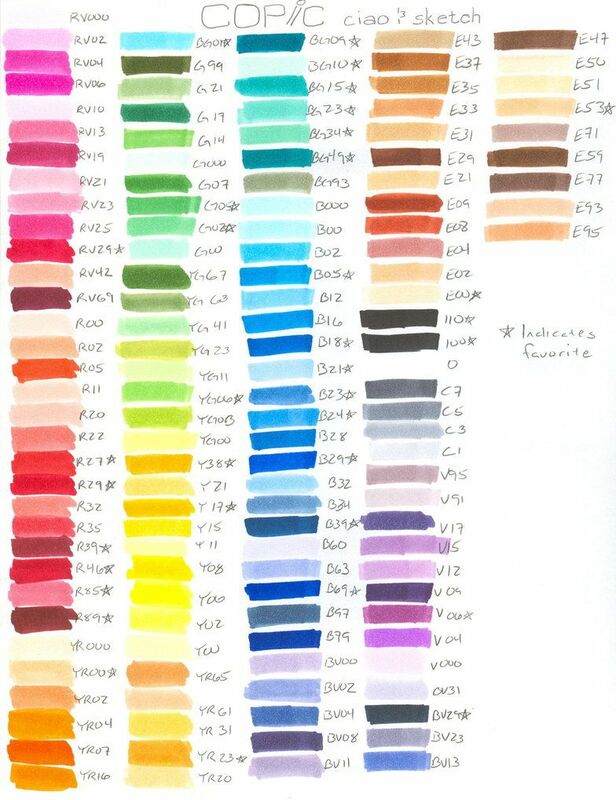 It'd be a dream to own a big selection of pastel colours, but I haven't been drawing much recently so I haven't felt the need to make buying more shades a priority. It's generally quite easy to find out what shades go together, too, as they are all in their own colour families, and it's more often than not the number after (for a darker shade) or before (for a lighter shade) that you need. 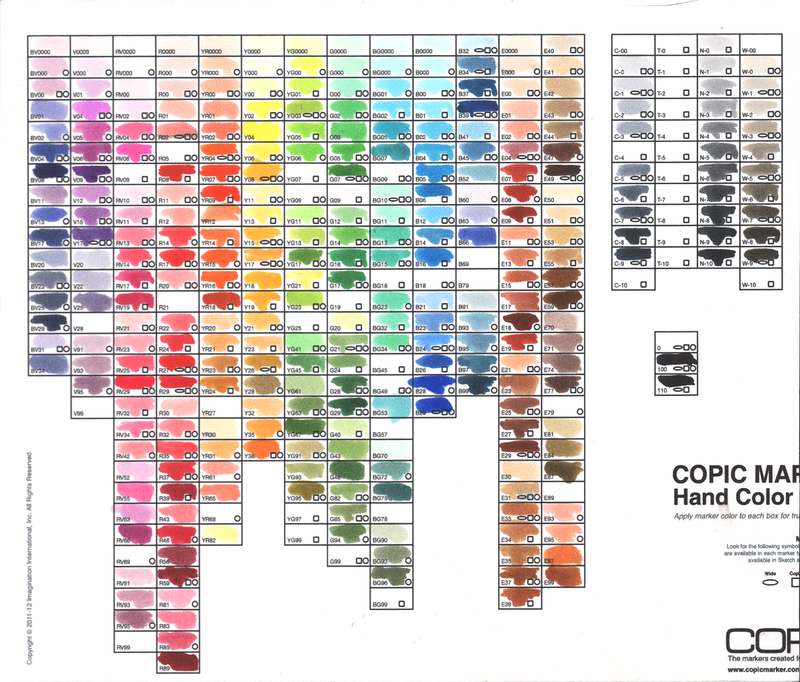 If you're really stuck, make sure to check out some swatches on Google like here and here to figure out what you're after and what the colour families look like. You can get these from loads of different retailers, and as I tend to know specifically what shades I want, I always buy them individually rather than in sets. I usually buy from Cult Pens or Tiger Pens - it just depends who is selling them cheaper at the time! There are paper pads out there designed for Copics, but the best pads I've found by far are the Daler and Rowney Watercolour line. I use the postcard sized pads the most, as I find they're just the perfect size for my drawings - I love how small and compact they are so it's easy to fit a design onto the page that'll take up the whole thing with no awkward gaps! I also sometimes use the A4 size, but not very often. For A5 I use the Winsor and Newton Artists' Watercolour Paper pad. The texture is a bit rougher so sometimes the colour of my Copic might not be as strong and I have to go over it a bit more to get it to its true colour, but I'm used to working with this paper now and I don't really mind. I tend to get my Daler & Rowney pads from Hobbycraft, but they're also available at WH Smith, which is where I also purchase my A5 pads. Seems silly, but I thought I'd mention the pencils I always use because I do enjoy them and just don't really use anything else. They're sturdy pencils that are easy to shapren, and they also don't leave too harsh a line which means I can easily rub out any old pencil marks from my drawing to make it look neater. As I mentioned above, I don't know what my eraser is anymore which is super annoying. I remembering buying it from Hobbycraft, but I can't seem to find it on the website! I've been using these pens ever since I started drawing my doodles, and I absolutely love them. They don't bleed or mix with my Copics, and the fine nib (I use 0.8) means that I can draw all the little tiny details onto my illustration without being clumsy about it. I often do have to draw several lines for the main outline of my drawings, so that it looks a bit thicker than the detailing, so ideally I'd like to pick up a new, slightly thicker fineliner, but I'm happy with this one for now, and as I have quite a few, I'll wait until I've used them up. I also find that this pen hasn't faded with time yet, even for drawings that are 2+ years old. I know a lot of people seem to enjoy using Sharpies, but I find them quite hard to get behind. Jack bought me the big massive set from WH Smith for Christmas 2015 as I really wanted to use them, but I have to admit I've barely touched them. The metallic Sharpies, on the other hand, I can totally get behind. I love them for dot work and backgrounds, as well as just adding detail to my images. The fineline Sharpies are also pretty good, but I find they can bleed when used with Copics, so it's best to wait for your Copics to be totally 100% dry - I'd probably actually give it a day before going in with the fineliners, just to be totally sure! Any doodlers out there - what do you guys like to use to draw and colour?